Only a small fraction (10%) of genetically unselected patients with chemorefractory metastatic colorectal cancer benefits from the anti-EGFR antibodies cetuximab or panitumumab (‘primary’ or ‘de novo’ resistance). Further, almost all patients who initially respond become resistant over the course of treatment (‘secondary’ or ‘acquired’ resistance). 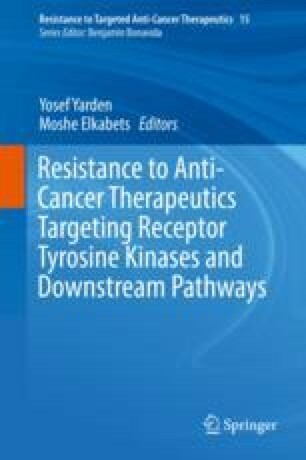 Studies in cell lines, patient-derived tumorgrafts, and archival surgical specimens have identified many biomarkers of both primary and acquired resistance to anti-EGFR antibodies, and it is now evident that resistance mechanisms revolve around common genetic lesions and share analogous signaling traits. Here we discuss how resistance to the EGFR blockade is attained in colorectal cancer and elaborate on alternative therapeutic strategies that are now under development to improve response and contrast relapse. Kraus S, Nabiochtchikov I, Shapira S, Arber N. Recent advances in personalized colorectal cancer research. Cancer Lett. 2014. https://doi.org/10.1016/j.canlet.2014.01.025.